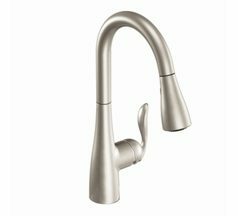 The Moen Arbor 7594 kitchen faucet features an exceptionally durable construction and meets low lead requirements in California and Vermont. Different single handle faucets (ex. Kohler Forte K-10433 and Moen Arbor 7594) which have spouts that can rotate 180° and 360°. 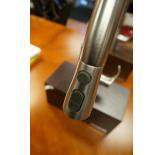 The Moen Arbor 7594 has a pulldown sprayhead that easily extends and retracts. From the Kohler Simplice K-647's sprayhead, you can pause the flow of water or operate in spray or aerated mode. The K-10433 is our favorite model from the Kohler Forte collection. Comparing the Kohler Simplice K-647 and K-649. 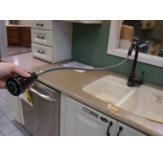 Looking for the best kitchen faucet to fit your home? 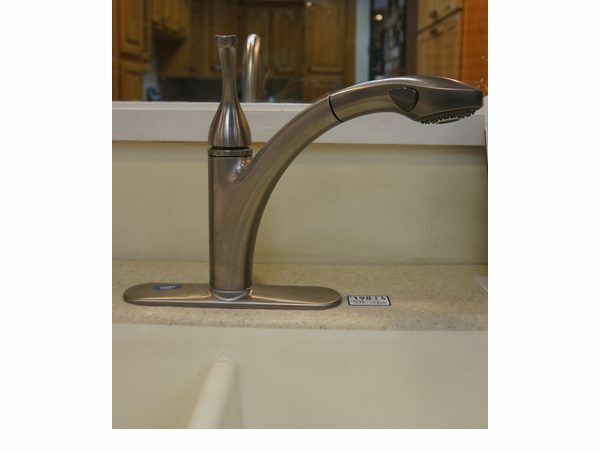 At ProductReportCard, we have researched the best kitchen faucet collections on the market and conducted in-depth reviews on faucets from some of our favorite collections. To better understand how they stacked up against one another, we chose to compare faucets in various price ranges based on the quality and durability of their construction and how their design/style and bonus features enhance their overall functionality. Lastly, we incorporated the feedback that each of the faucets has received from actual customers online. Based on our analysis, we then chose the best overall kitchen faucet, the best high-end kitchen faucet and the best kitchen faucet on a budget. Adjustable Flow Rate Kit Available? Pull-down sprayhead with a 68" flexible hose uses Reflex™ technology that is "40% easier to unlatch and extend"
Soap/lotion dispenser, deep roughing-in kit and 2 low flow kits. Soap/lotion dispenser, a deep roughing-in kit, and a low flow kit or a high flow kit for these faucets (sold separately). 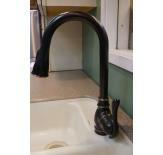 A good kitchen faucet is an essential part of your home. Which style or look you prefer is a personal decision, but there are many other important aspects to consider when evaluating a new faucet. With that in mind, we have reviewed some of the best kitchen faucets on the market to help you find the best one for your needs and budget. 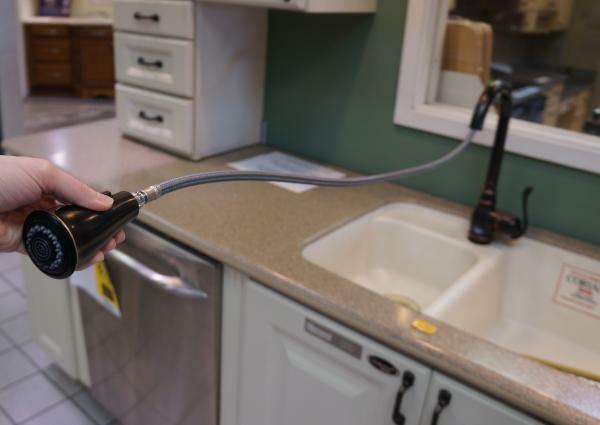 After you have finished reading our review, we highly recommend checking out our Kitchen Faucet Buyer's Guide, which will provide more in-depth tips to keep in mind before actually making your purchase. Here we assess the quality and durability of the kitchen faucet's construction. First, we evaluate the materials used. Faucets that have an all-plastic construction will be cheaper but less durable in the long run, and faucets that are all metal will be more durable but contain too much lead. 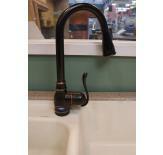 Therefore, the best faucets will be made from a combination of metal and plastic pieces. In terms of metal type, brass and steel will be the most durable even if they have been "finished" or plated with other materials. In addition, we also like it when the faucets meet with ab1953 (California) and s152 (Vermont) legislation. Whether or not you live in those states, they have the strictest legislation around lead and require all faucets sold to have an average lead content of 0.25% or less. Next, we look at the valve construction. Ideally, the faucet should have ceramic disk valves, but cartridge valves are still acceptable in our opinion. You will also come across ball valves and compression valves, but they are generally less durable than the previous two types mentioned. After valves, we look at whether the faucet's design is compliant with accessibility guidelines of the America Disabilities Act (ADA). While not required, it means that the faucet will be easy to use for any members of your household. Finally, we evaluate the manufacturer's warranty because we feel it is one of the best indicators of quality. Most solidly built kitchen faucets will be covered by a limited lifetime warranty for residential use, and we wouldn't recommend purchasing any faucet with less coverage than that. We determined that all of the faucets included in our review were built according to the highest quality and durability standards. They all feature a tough metal and plastic construction and are covered by a limited lifetime warranty. The Moen Arbor™ collection (models: 7594, 5995, 7294 and 7790) and the Moen Extensa® 7560 did slightly better than the Kohler Simplice® (models: K-647, K-649, K-596 and K-597) and Kohler Forté® (models: K-10416, K-10430, K-10413, K-10415, K-10411, K-10412 and K-10445) faucets however because the Moen faucets comply with low lead requirements in California and Vermont. The Kohler Forté® K-10433 also scored slightly lower than the rest because it isn't ADA-compliant. Here we evaluate how the faucet's design and style impact its functionality. First, we look at whether the faucet features a single or double handle, and, if it has a single handle, where it is located. Faucets that have a single, top-mounted handle will be the most convenient to use because you can easily adjust the water flow and temperature without actually touching the handle when your hands are dirty. A single handle attached to the side of the faucet is also convenient, but, if you have a backsplash, you should check to see if there is enough room for the handle to turn completely. In general, we prefer all pieces of the faucet to be attached because we think it offers a sleeker look and is just easier to clean around, but some people may prefer the look of a single remote handle or even double handles. While double-handle faucets offer improved control over temperature and flow rate, we think they are more of a hassle than they are worth in the kitchen. Next, we assess the spout design. 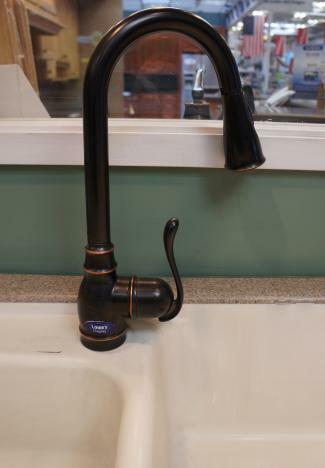 We do not incorporate spout shape or size into our scoring because those features are really dependent on the type of sink that you have (learn more in our Kitchen Faucet Buyer's Guide). However, we do care about how the design of the spout impacts the faucet's usability. 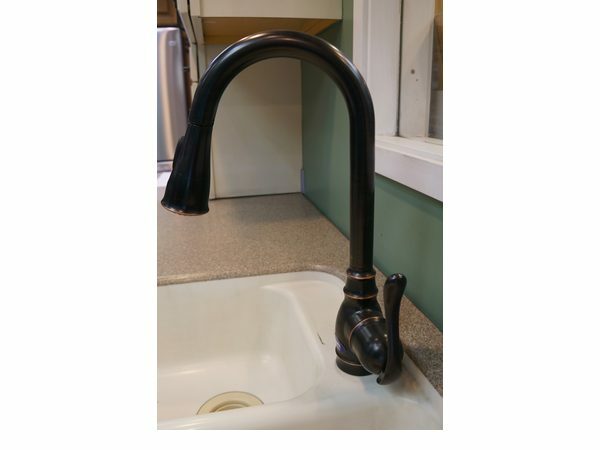 We like when the spout can rotate 360°, 180° or even 120° because it allows you to reach more areas of your sink and also allows you to push the spout out of the way if you need to make room for any large items. After considering the spout design, we evaluate the entire collection in which the individual faucet model is included. Since it can help create a more cohesive interior design, we love it when a collection features different faucets that could be used for a bar/prep sink or even ones that could be used in a bathroom. 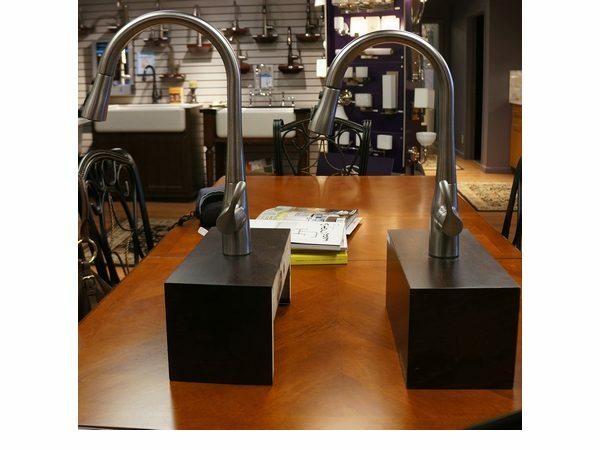 Lastly, we consider the available finishes for each faucet. We prefer to have multiple finishes to choose from including finishes that have undergone a process known as physical vapor deposition (PVD), which make the surface of the faucet significantly more durable. 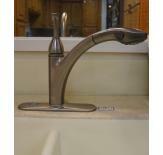 The kitchen faucets in the Moen Arbor™ collection (models: 7594, 5995, 7294 and 7790) ranked the highest in this category. 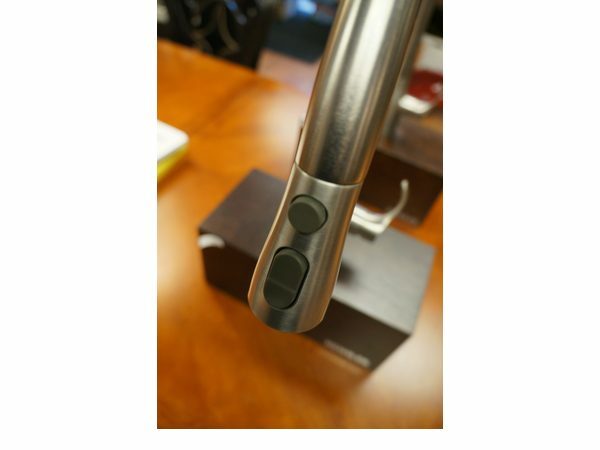 They have an have an optional escutcheon plate, a single attached handle that can be mounted on either side of the spout, and a spout that can rotate 360°. 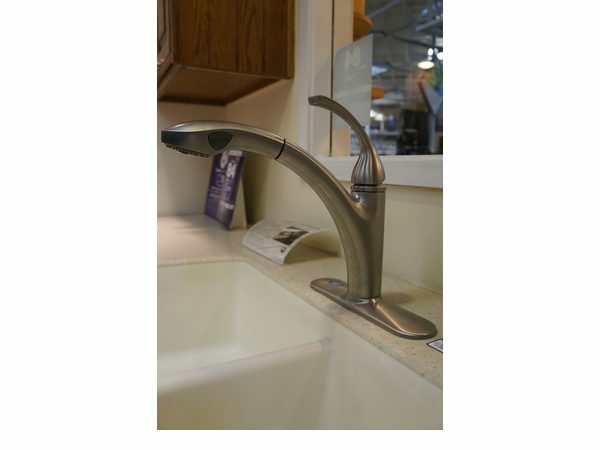 The collection also features four different models, including one that could be used for a bar/prep sink, and, with the exception of the faucet with motion activation technology, all of the models are available in five different finish options. While almost all of the Kohler Forté® kitchen faucets (i.e. K-10416, K-10430, K-10413, K-10415, K-10411, K-10412 and K-10433) performed well in this category, the Kohler Forté® K-10445 fell short. It is only available in two different finishes, and, while some people might like the style and temperature/flow control of a double-handle faucet, we feel it is much less convenient in a kitchen setting. 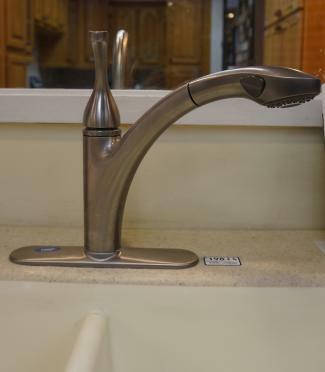 Here we assess the bonus features that can enhance a basic kitchen faucet. First, we look at whether the faucet has a pull-down or pull-out sprayhead or a remote side sprayer. Depending on your sink, we tend to prefer pull-down or pull-out sprayheads because we like the look and convenience of these models. They allow enough room for you to fill big pots and are more mobile so you can reach all areas of your sink. 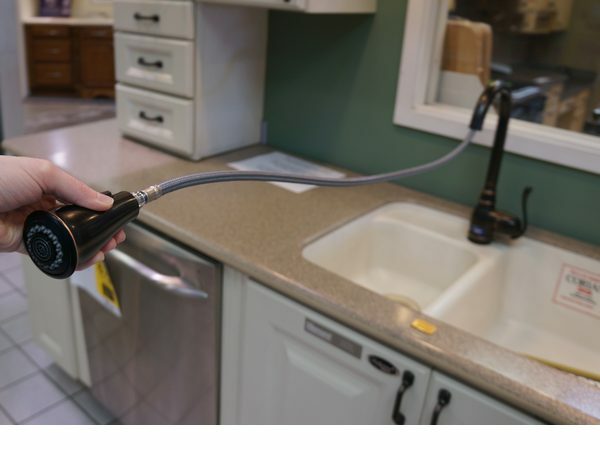 A side sprayer will still accomplish these things, but they take up more space on your countertop and make it slightly more difficult to keep the area around your sink clean. Next, we check whether the spigot has different modes of operation. 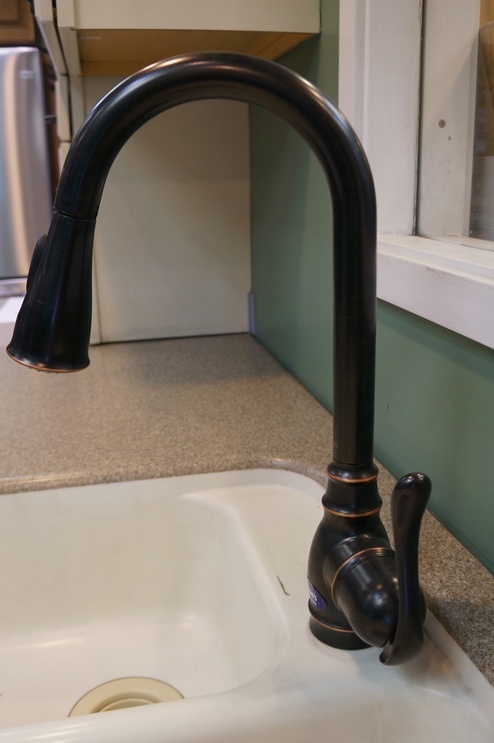 Some will allow you to operate in spray or aerated flow mode, and some even allow you to pause the flow of water temporarily, which is a great feature when you need to move the faucet around to fill something up or remove something from the sink. 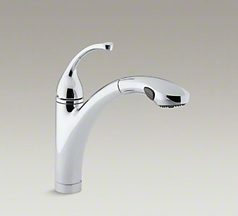 While only available on a limited number of models, faucets that have motion activated on/off functionality are also particularly nice to have if you can afford it. Next, we look at temperature controls on the faucet. For additional convenience, we love when a faucet has temperature memory settings, and, for protection against scalding (especially in homes with kids), we also really like it when we can set high temperature limits on the faucet. Lastly, we look at what kind of additional accessories are available including things like an adjustable flow rate kit, a built-in water filter and a matching soap/lotion or hot water dispenser. The highest performing faucets in this category were the Moen Arbor™ 7594 with MotionSense™, the Kohler Forté® K-10433, and the Kohler Simplice® K-647 and K-649. All three models have a pull-down sprayheads with pause/spray/aerated flow functionality and temperature memory settings. They also have adjustable flow rate kits and matching soap/lotion dispensers available. They all lack a built-in water filter and a matching hot water dispenser. The Moen Arbor™ 7594 with MotionSense™, is the only model with motion activation, but it doesn't have high temperature limits like the Kohler Forté® K-10433, and the Kohler Simplice® K-647 and K-649 do. Finally, we considered the feedback that the faucets have received from customers online. Fortunately, there were plenty of reviews to use in the scoring process, and so we gave this category a slightly heavier weight than we normally do. While we think customer feedback is incredibly important, we sometimes feel that it can be unreliable (ex. uneven number of reviews, unhappy customers more likely to complain, etc.). However, in this case, there were so many reviews available that we knew it would be a mistake not to reflect the opinions of these customers in our overall scores. 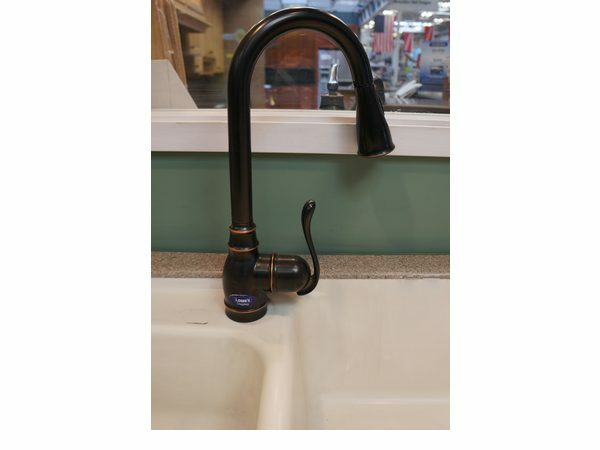 While there were some issues here and there with the models we reviewed, almost all of the faucets received very good to excellent ratings from customers online. The only exception was the Kohler Forté® K-10412, which received only received an average rating. While the Kohler Simplice® models K-647 and K-649 were close, our overall favorite kitchen faucet collection was the Moen Arbor Kitchen Faucet Series (models: 7594, 5995, 7294 and 7790). We wish that the handle was mounted behind the spout, but, otherwise, it is a durable, stylish faucet with excellent functionality. 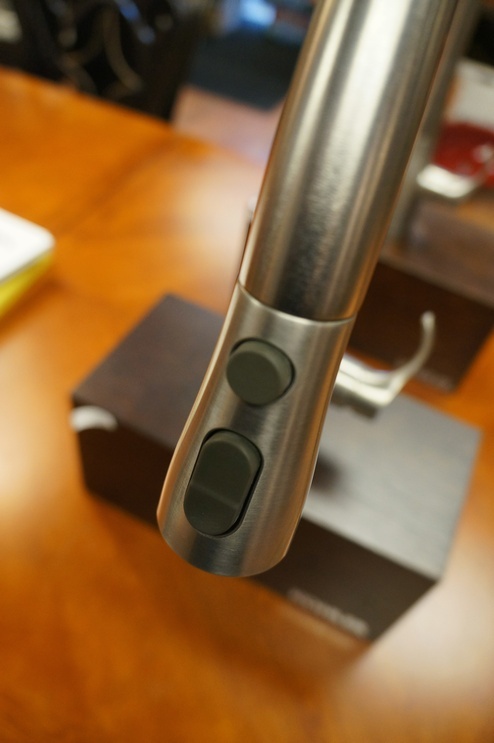 We love the convenience of the pull-down sprayhead and that the spout can rotate 360°. We also particularly like that our favorite model, the 7594, comes with optional motion activation technology (MotionSense™). 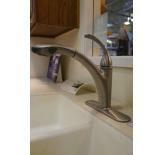 Our favorite overall faucet is the Moen Arbor 7594. 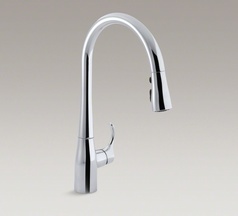 Our favorite high-end kitchen faucet is the Moen Arbor Kitchen Faucet 7594 with MotionSense™. 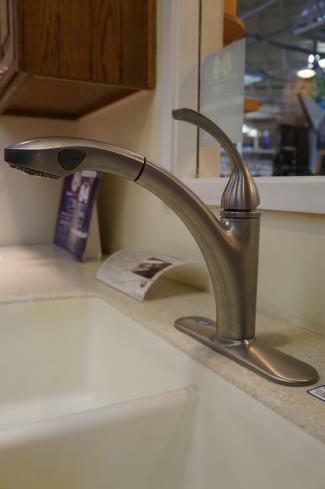 Despite being over , it is a well-built faucet that has all of the features one could need including motion activation sensors in two places on the spout. We are a little disappointed that it only comes in three different finishes and doesn't have a high temperature limit setting, but otherwise there isn't much more we could ask for in a faucet. If you are on a budget, we love the kitchen faucets in the Kohler Forte Kitchen Faucet Collection, particularly the K-10416, K-10430, K-10413, K-10415, K-10411 and K-10433. The collection offers durable, dependable faucets that have received excellent ratings from professionals and consumers alike. We really like that there are numerous models available in the collection in various finishes and that many of the models offer functionality similar to their higher priced competitors. While we aren't big fans of the Kohler Forté® K-10412 and K-10445 we would highly recommend the other models, particularly the K-10433.